Sam Urmy is a postdoctoral fellow working in Kelly Benoit-Bird’s Acoustical Ocean Ecology Group. He is interested in how marine animals navigate the variable ocean environment, and how their individual movements and interactions scale up to shape the distributions of their populations. He uses remote sensing tools like acoustics and radar, interpreted with the help of mathematical and statistical models. 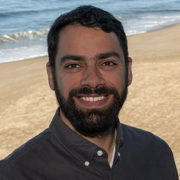 Samuel earned his PhD in Marine and Atmospheric Sciences from Stony Brook University for his thesis Quantitative foraging ecology of terns at Great Gull Island, New York: Theory, models, and remote sensing of collective behavior in a dynamic habitat. Additionally, he holds an MS in Aquatic and Fishery Sciences from the University of Washington and a BS in Earth Systems from Stanford University.